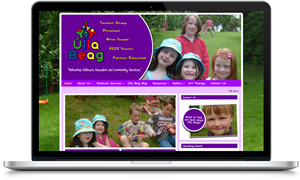 Úlla Beag, which opened in September 2010 provides childcare and community services within a safe and secure environment where kids enjoy a “home from home” experience. We were asked to design a new logo which reflected their ethos and values and to build a website which allowed them to share information easily with prospective clients, parents, staff and other organisations. The service has grown from strength to strength and we were privileged to work alongside Denise and her staff in getting the project off the ground.